Length: 11.63 m (453 inches). Height: 3.20 m (125 inches). Weight: 16.500 kg (36.300 lb.). Engine: Leyland EO.690, 11.100 cm3 (677 cubic inches) displacement. Horsepower: 210 at 2.200 rpm. Tyres: 12 R - 22,5. Crew: 1 + 21 (18 on stretchers). 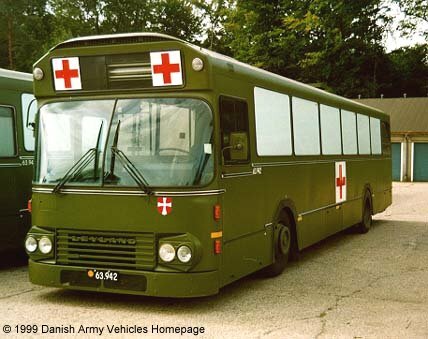 Additional: The Leyland bus shown as ambulance.